What do a roundabout in Marble Arch, a beach in Aldeburgh, and a high street in Walthamstow have in common? All are about to get their own theatres, temporarily at least, showing off the next generation of pop-up venues. Underbelly Productions has built a new temporary theatre next to Marble Arch tube, to host a revival of the musical Five Guys Named Moe, while HighTide Festival this year has a portable structure called the Mix, which will be springing up in Suffolk, the new-writing festival’s home, and – for the first time – north London. Plays include Sam Steiner’s Kanye the First, Nessah Muthy’s Heroine and Theresa Ikoko’s Girls. Five Guys Named Moe is set in a 1940s New Orleans jazz bar. Bartlam and his business partner Charlie Wood were only interested in reviving it if they could really run with that setting. A standard West End theatre wasn’t going to cut it – especially given their plans for the bar. 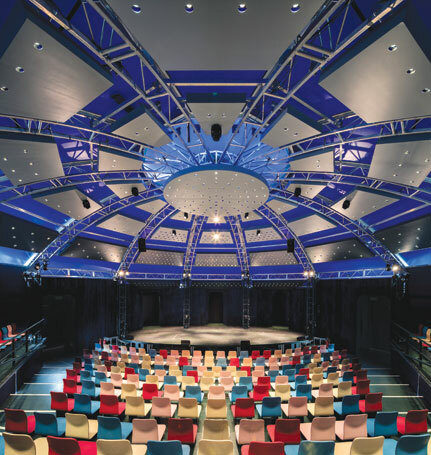 “We were strongly of the opinion we didn’t want to put it into a conventional proscenium-arch theatre,” says Bartlam, who’s been overseeing the theatre’s construction, from the installation of the bar to the drainage for the loos. 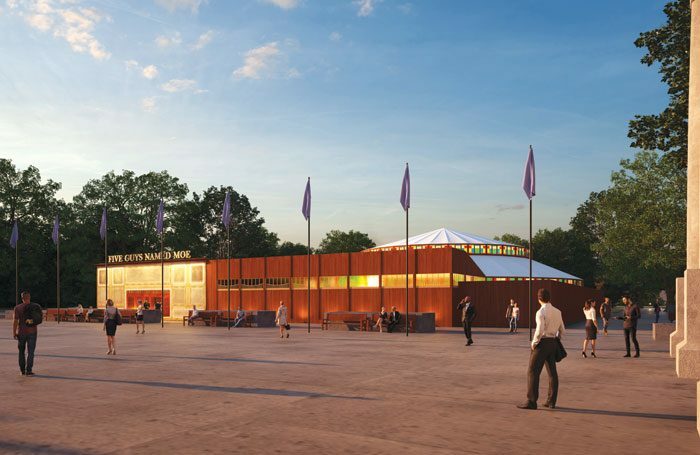 The construction itself is a 607-seat wooden and canvas spiegeltent, creating a 26-metre diameter in-the-round performance space, with most of the audience sat among the action on cabaret tables. Underbelly has used the spiegeltent for shows before, although it’s been given an all-new, New Orleans makeover by theatre designer Takis – think iron trellises rather than a speigeltent’s usual mirrored twinkle. The audience enters through the 15-metre by 12-metre foyer bar. Wooden walls run around the outside of the whole structure, giving it the appearance of a fairly solid shed, although the backstage dressing rooms are housed in a bright, white marquee. Creating a pop-up theatrical world is nothing new. From pioneering site-specific companies such as Shunt and Punchdrunk to the immersive environments of shows including Alice in Wonderland or the soon-to-open Hair at venues such as the Vaults, there’s a huge appetite for work that transports its audience to the world of the production. Making the theatre itself transportable is, however, still less common. Of course, the National Theatre’s wildly successful temporary space the Shed was a pop-up pioneer, and high-spec shows from The Railway Children to Lazarus were staged at the temporary King’s Cross Theatre. But when it comes to being portable, Paines Plough has been leading the way with Roundabout, its in-the-round touring space. After a successful stint at Edinburgh, it is taking the Roundabout to towns including Margate, Lincoln and Darlington, staging Brad Birch’s Black Mountain and Elinor Cook’s Out of Love. 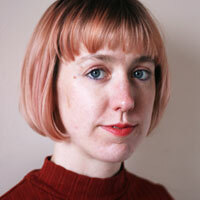 Roundabout’s flatpack space was designed by Studio Three Sixty, a company founded by lighting designer Emma Chapman and theatre designer Lucy Osborne. Genuinely innovative, it won The Stage’s theatre building of the year award in 2015. The company’s latest creation is the Mix, a next-generation pop-up theatre, and HighTide’s new, moveable home. A circular 22-metre diameter structure, it has flexible, multicoloured seating created by furniture designer Felix de Pass, holding 267 people in the end-on configuration HighTide is using. Twelve hydraulic metal arms raise the roof. Between them are 43 LED lighting panels that do indeed look futuristic. For Jellis, this is the advantage of a pop-up space: less its ability to create a specific world, more its ability to move between worlds. 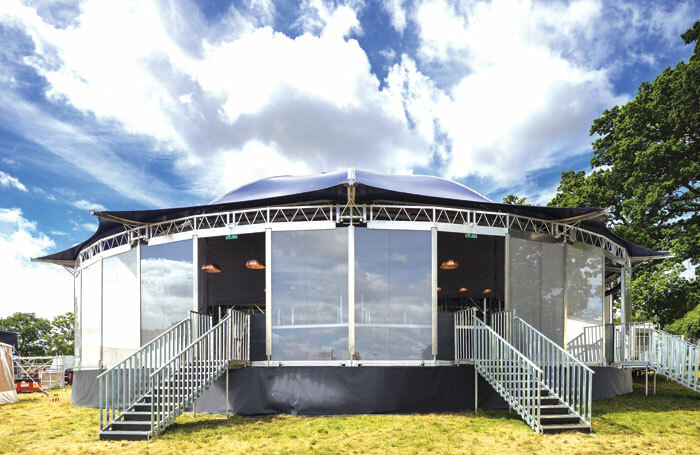 Jellis echoes Bartlam in pointing to recent advances in quality and technical specifications for pop-ups – forget draughty marquees or wobbly lighting rigs. Still, there are challenges. Although the Marble Arch theatre’s structure was raised in just four days, the team has been on site since July, digging down to connect the venue with the sewage system. They’ve had to bring in massive generators – pumping out air-conditioning on the baking bank holiday when I visit. And while the space has a high-spec lighting rig and amplification system, being in a busy junction does raise acoustic issues. Still, opting for a busy urban location was a deliberate choice for HighTide: it hopes to attract passing traffic as well as theatre fans. The core programme is bolstered by comedy and family shows, while the whole festival site is open to non-ticket holders, and boasts a pop-up tepee bar and street food vendors. Just as Marble Arch Theatre is intended as a place to spend a whole evening – with drinks, food and music as well as the show – the aim is that HighTide becomes a hangout as much as a cultural experience. This obviously makes such pop-ups a more lucrative commercial offering. But there’s also a more idealistic aim: “Hopefully it will make it this fun, buzzy site that will feel very different to the experience of going to a theatre,” says Jellis.